At least five isoforms of Nogo are known to exist; this antibody is specific for NogoA. NogoA Antibody is affinity chromatography purified via peptide column. NogoA antibody was raised against a 23 amino acid synthetic peptide from near the amino terminus of human NogoA. NogoA Antibody is supplied in PBS containing 0.02% sodium azide. NogoA antibody can be stored at 4 degree C for three months and -20 degree C, stable for up to one year. As with all antibodies care should be taken to avoid repeated freeze thaw cycles. Antibodies should not be exposed to prolonged high temperatures. Small volumes of anti-RTN4 antibody vial(s) may occasionally become entrapped in the seal of the product vial during shipment and storage. If necessary, briefly centrifuge the vial on a tabletop centrifuge to dislodge any liquid in the container`s cap. Certain products may require to ship with dry ice and additional dry ice fee may apply. NogoA Antibody: NogoA is a member of a family of integral membrane proteins termed reticulons that are thought to be involved in numerous disorders including neurodegenerative diseases. Reticulon proteins are known to regulate many cellular processes and interact with multiple proteins and receptors such as BACE. NogoA was initially identified as a myelin-associated neurite outgrowth inhibitor. It is highly expressed in oligodendrocytes in the white matter of the CNS; blocking its activity with antibodies or other factors results in improved axon regrowth and functional recovery in experimental CNS lesion models. NogoA has also been suggested to play a role in neurodegenerative diseases such as Amyotrophic lateral sclerosis, in which case NogoA is found at elevated levels in postmortem muscular samples, and multiple sclerosis (MS), in which case autoantibodies to NogoA have been found in serum and cerebrospinal fluid in MS patients. 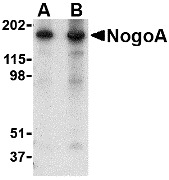 NogoA antibody can be used for detection of NogoA by Western blot at 0.5 - 1 mug/mL. Despite its predicted molecular weight, NogoA typically migrates at 180 kDa in an SDS-PAGE. Antibody can also be used for immunohistochemistry starting at 2.5 mug/mL. For immunofluorescence start at 20 mug/mL. Western blot analysis of NogoA in mouse brain tissue lysate with NogoA antibody at (A) 0.5 and (B) 1 μg/mL. 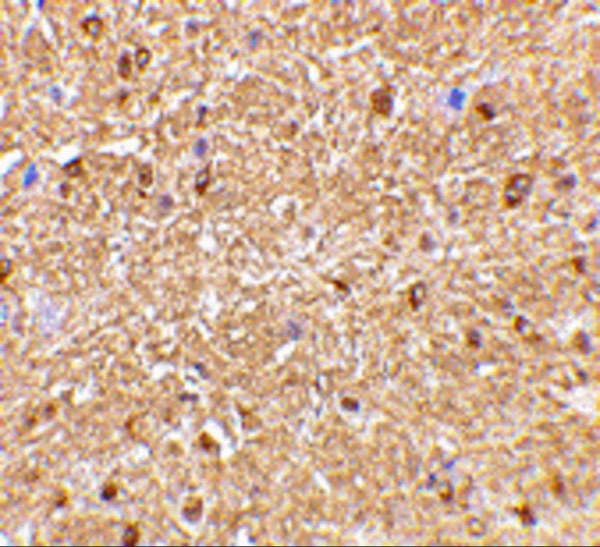 Immunohistochemistry of NogoA in mouse brain tissue with NogoA antibody at 2.5 μg/mL. 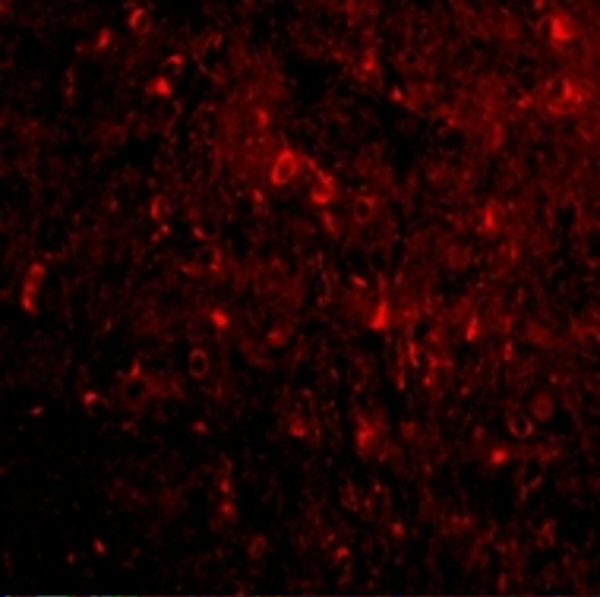 Immunofluorescence of NogoA in Mouse Brain cells with NogoA antibody at 20 μg/mL. NCBI/Uniprot data below describe general gene information for RTN4. It may not necessarily be applicable to this product. Nogo: Developmental neurite growth regulatory factor with a role as a negative regulator of axon-axon adhesion and growth, and as a facilitator of neurite branching. Regulates neurite fasciculation, branching and extension in the developing nervous system. Involved in down-regulation of growth, stabilization of wiring and restriction of plasticity in the adult CNS. Regulates the radial migration of cortical neurons via an RTN4R-LINGO1 containing receptor complex. Isoform 2 reduces the anti-apoptotic activity of Bcl-xl and Bcl-2. This is likely consecutive to their change in subcellular location, from the mitochondria to the endoplasmic reticulum, after binding and sequestration. Isoform 2 and isoform 3 inhibit BACE1 activity and amyloid precursor protein processing. 6 isoforms of the human protein are produced by alternative splicing. 1. the present study found that Nogo-A depletion was capable of inhibiting HCC SMMC-7721 cell proliferation by promoting G2/M cell cycle arrest and apoptosis.